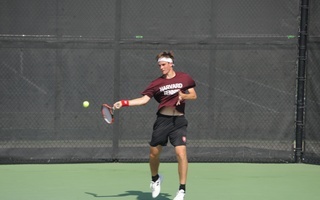 This weekend, the Beren Tennis Center witnessed 78 matches as the Harvard men’s tennis team took on Illinois, Notre Dame, and Texas A&M in the grueling Chowder Fest tournament. In this intense three-day season opener for the Crimson, the players tackled a high volume of matches, rapidly transitioning from summer training into the competitive season. Harvard saw ups and downs throughout the weekend. The team struggled initially in doubles but also had some standout individual performances. Senior Brian Yeung led the team and ended the weekend with 7 matches under his belt, nabbing 2-1 in singles and 3-1 in doubles with his partner, sophomore Michael Peters. Sophomore Andy Zhou, who was a consistent force on the team last year, overcame a wrist injury and earned a 2-1 record in singles. The Crimson went 4-5 in singles play on Sunday, with Yeung, Zhou, Peters, and freshman Logan Weber taking home victories. Zhou faced a particularly demanding matchup against Notre Dame junior Drew Dawson. After falling behind 4-1 in the first set, Zhou kept his calm and came back to take the set in a close tiebreaker. On the brink of a comfortable 5-2 lead in the second set, however, Zhou gave up three consecutive games and found himself down 5-4. Zhou managed to recover and again the set went into a tiebreaker. 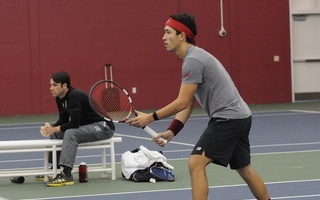 Zhou’s strong mental game gave him enough of an edge to win the tiebreaker and earn a 7-5, 7-5 victory for Harvard. “You feel very hyperactive and you feel like the situation is spinning out of control, but I managed to play one of my best points to win. It was such a boost of confidence,” Zhou said. The Crimson earned victories in three of its five doubles matches on Sunday. Yeung and Peters handily defeated the Notre Dame opponents 6-2, and captains Sebastian Beltrame and Jean Thirouin overcame their Texas A&M opponents. While Zhou and Weber fell 6-0, sophomore Samuel Beren and junior Grant Solomon earned a 6-3 win. Having focused less on doubles in practice, the team’s improvement in doubles was noticeable across the weekend. The Crimson struggled in singles on Saturday, earning only three wins in its 13 matches throughout the day. Zhou and Weber bested their Texas A&M opponents while Beren edged out his Notre Dame opponent in a tight three-set match. The Saturday matches were a valuable learning opportunity for the new freshmen on the team, as freshmen Galen Lee and Weber both took the courts twice that day. For the fourth time in five years, the Harvard men’s tennis team started off its spring schedule with a win. And for the second season in a row, it came at the expense of William & Mary. Overall, the team went 15-8 in singles and 5-3 in doubles. Freshmen Robert Wrzesinski and Constantin Zoske, sophomores Galen Lee and Logan Weber, juniors Andrew Ball, Michael Peters, and Andy Zhou, and seniors Grant Solomon and Jean Thirouin competed in the weekend’s match-ups against the Tribe, Middle Tennessee State, Penn State, Old Dominion, VCU, and Richmond.